James Hammarhead needs no introduction here. One of the USA’s most thoughtful bike builders, he’s the creator of the Jack Pine—one of the most sought-after and usable custom bikes of recent years. 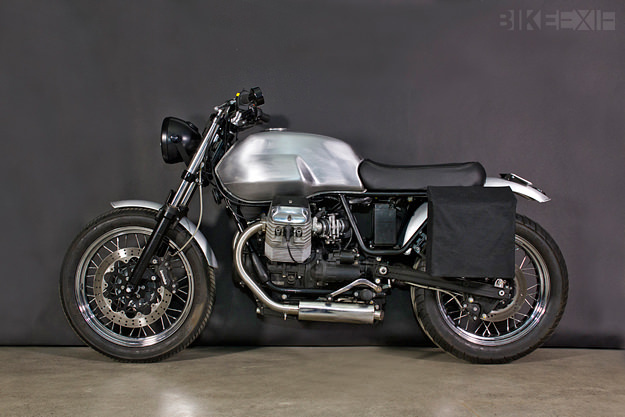 This custom Moto Guzzi V7, nicknamed ‘Wayward,’ is Hammarhead’s latest creation: A one-off built with the official sanction of Moto Guzzi USA. Hammarhead replaced the large stock fenders with alloy units and the ancillary components were cleanly repackaged—with a simple black battery mounted low in the frame. The engine has not been internally modified, but performance benefits from high-flow K&N air filters, a free breathing custom exhaust and remapped fuel injection. Performance fork springs and rear shocks were fitted, and the bike rolls on Avon tires. 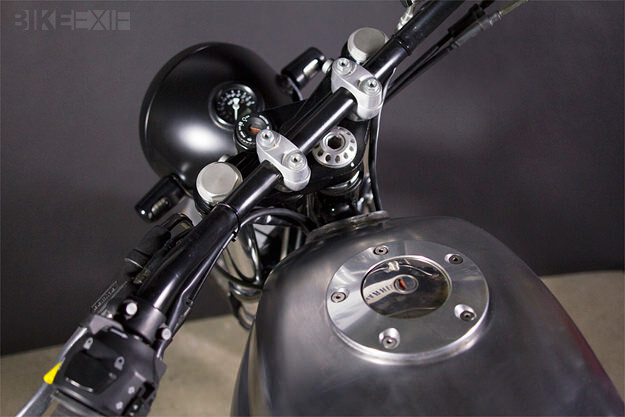 Up front, the stock headlight and instrument cluster have been swapped out for a classic 7-inch teardrop shell that carries a 48 mm MMB speedometer. The OEM cluster’s circuit board was retained and modified to output a remote low fuel warning light. To achieve a relaxed yet aggressive riding position, CR low bend bars, a Joker Machine bar end mirror and wide foot pegs were fitted. 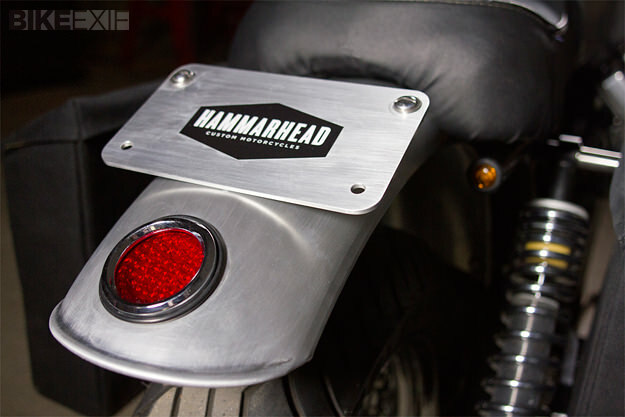 Hammarhead also cut and modified the rear sub-frame to integrate the rear turn signals and support a compact seat. 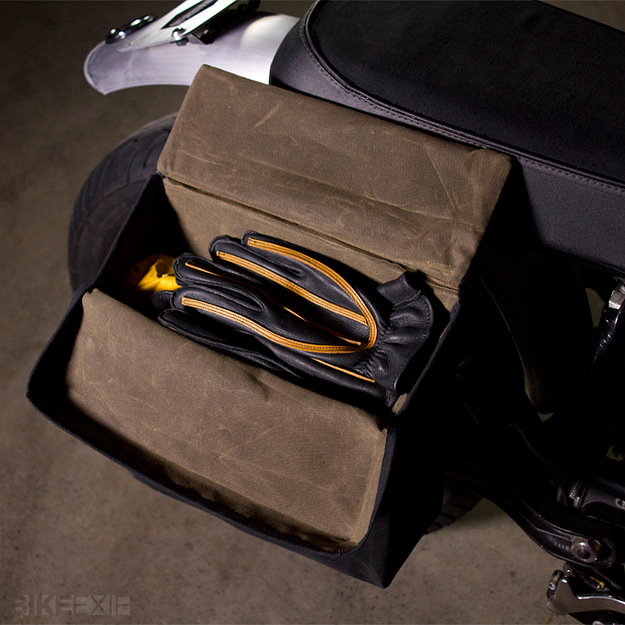 The final element is a pair of waxed cotton panniers. Drawing on the design of the HHI Daypack, they’re made from Martinex Wax Army Duck, with a leather-reinforced bottom. “The shape and scale was inspired by the bags of the 1950s,” says Hammarhead. “An L-shaped internal aluminum frame supports the cargo and is hard mounted to the motorcycle at three points.” With a combined capacity of 16 liters, the bags are small by modern standards—but they’ll swallow a laptop, rain suit and workout gear for the weekday hustle. Or the essentials required for a long weekend of travel. 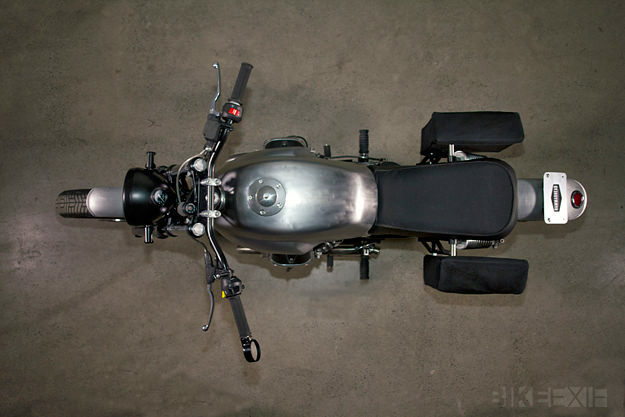 Or add a small tank bag, and never look back.